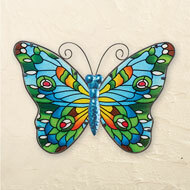 This beautifully detailed butterfly will make a colorful addition to your home, indoors or outside. 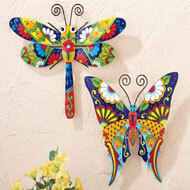 It features stunning glass wings that sparkle in the light along with a metal body and textured details. Hooks on back for easy hanging. Glass and metal. (16 1/4"L x 14"H). 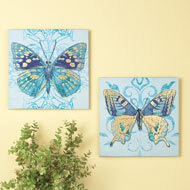 Add beautiful color and elegant style to your home with this unique set of two butterfly canvases. Bold butterflies in shades of blue are accented with stunning metallic gold details, while hooks on the back make hanging easy. Polyester and wood. Each is 12"Sq. Set of 2. 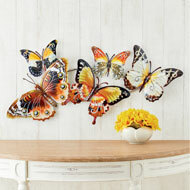 Instantly add color and dimension to your home with this beautiful wall art. The graceful, scrolling vine is accented with leaves and sparkling blue crystals while four colorful butterflies perch along the vine. 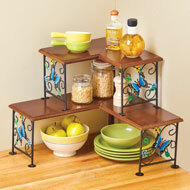 Hardware on the back makes it easy to hang indoors or outside. Metal. 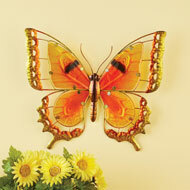 8 1/2"L x 24"H.
With a beautiful stained glass look, these brightly colored butterflies will make a dazzling addition to your décor, indoors or outside. 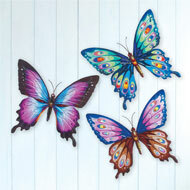 Choose the blue or purple butterfly, or both for a terrific display. 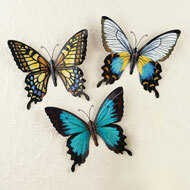 Each has a metal body and scrolling antennae with mosaic colored wings. Hook on back for easy hanging. Glass and metal. 14 3/4"L x 10 1/2"H. Choose: Blue or Purple. 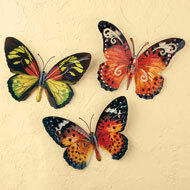 A beautiful way to add color and style to your home, this trio of glass butterflies are perfect indoors or outside. 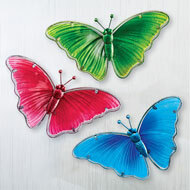 The set includes three butterflies in red, green and blue – each has a metal body and colored glass wings. Hook on the back for easy hanging. Metal and glass. Each is 10 1/2"L x 6 3/4"H. Set of 3. 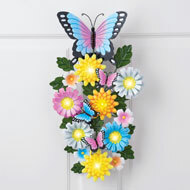 This colorful wall clock instantly adds a touch of beautiful floral charm to your home. 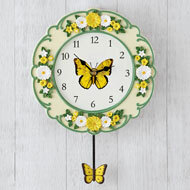 The handpainted clock has a lovely yellow and white daisy border around a bright yellow butterfly on the face while a butterflydecorated pendulum swings from the bottom. Requires 1 "AA" battery (sold separately). Resin and metal. Hook on back for easy hanging. 8 1/2"Dia. 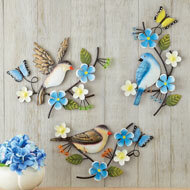 x 12"H.
This trio of charming, handpainted birds add color and seasonal style to any wall in your home. 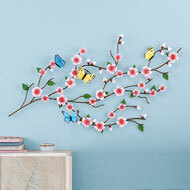 Displayed together or separately, the set includes three birds on scrolling branches accented with flowers, butterflies and berries. 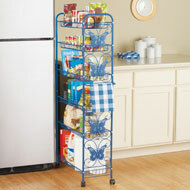 Each has a hook on the back for easy hanging. Metal, plastic. Each approx. 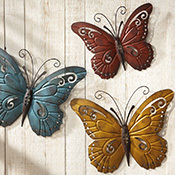 11"L x 11"H.
This beautiful wall clock adds color and charm to your home. 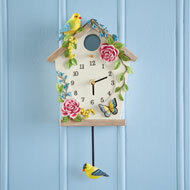 The handpainted birdhouse clock has a lovely yellow bird perched on top and has floral and butterfly accents. A yellow bird pendulum swings from the bottom. Requires 1 "AA" battery (sold separately). Resin and metal. Hook on back for easy hanging. 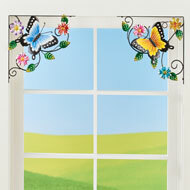 Measures 7 1/4"L x 2 1/4"W x 13"H.
Instantly update your décor and add a bit of sparkle with these unique decal sets. The beautiful hummingbirds and flowers have a dimensional design and a metallic sheen. They adhere easily to smooth surfaces and are removable and repositionable without causing damage to the walls. Instructions included. Plastic. 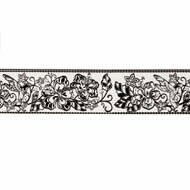 Hummingbird Decal Borders Set of 4, (14"L x 4 1/4"W). 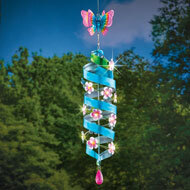 This colorful spinner will bring light and sparkle to your yard all year long! 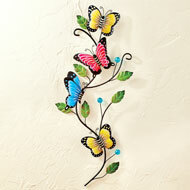 A blue, yellow and pink butterfly tops the spinner which features a metal spiral surrounded by flowers. 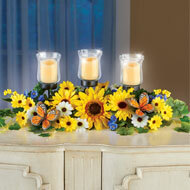 The flowers automatically shine with light at night.  Includes a chain and hook for hanging and 1 "AA" rechargeable battery. 4 1/2"Dia. x 23"H (28"H with chain). 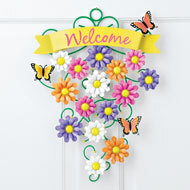 Decorate your garage door with this lovely design of climbing pink roses, horseshoes, colorful butterflies and shamrocks. 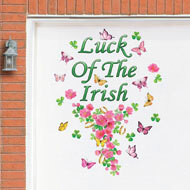 The set also includes the words, "Luck of the Irish" – arrange the pieces however you please. Easytoapply magnets adhere to your metal garage door and remove without residue to be used year after year. Magnet. Largest piece measures 12 1/2"Dia. x 15"H.